Gosh golly. I love cookies. And I really love these cookies. 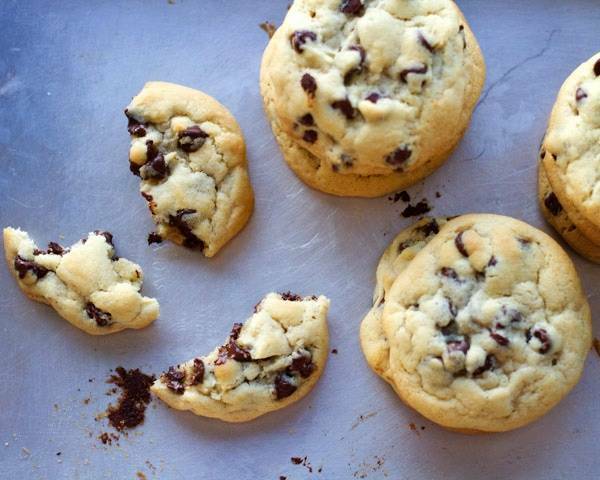 These are the PERFECT chocolate chip cookies. I’ve made hundreds of thousands of millions of cookies in my 26 years of life, and that is a fact. Theeeeese are probably my all-time favorite. Okay, that’s hard to commit to. Because what about these? My other all-time favorite, the peanut butter chocolate chip oatmeal cookie? Can you settle knowing that these are my current all-time favorite? Time will tell which one actually wins out. But considering I’ve made three batches of these in one week which equals out to about 10 1/2 cookies per day, I think things are looking good for this recipe. Just so you know, I didn’t eat all those. Mm mm. I first made these when I was actually planning to make cookie brownies. I was missing my best friend who makes the world’s best cookie brownies, so actually I was sort of missing her AND her cookie brownies, and I fully intended to make the cookies AND the brownies. Cookie brownies. It’s normal to bake in 100 degree weather, right? Come look at my shirt right now. Not even funny. But what happened instead was that I started making the cookie part, realized I had no brown sugar, and decided to just go for it with ONLY WHITE SUGAR. I tried to make up for the brown color and flavor (uh, sort of) by adding a little maple syrup. Turns out I only had a tablespoon of that, too. I went for it anyways. And the result was phenomenal. So phenom that I decided to ditch the brownie part. At first I thought they were going to be weird. They came out looking a little bit like my legs in February: pale city. But as they cooled it was like magic. The color evened out and they firmed up perfectly, in that soft but firm cookie way where you can bite it without it falling all over the place but it won’t make a crunching noise? you know that one? and it was thick, and chewy, and buttery soft but not cakey… ohmygosh. It was cookie perfection. Also a bonus is that we are using the whole bag of chocolate chips here. None of this measuring most of the bag and being left with an awkward amount of chocolate chips that you can’t really do anything with except eat plain. Nope. We’re going all the way with the chippers. Dump them in. And as a result, the cookies are so chocolate chippy. I promise you won’t have one of those sad moments where you get to the end of your cookie and realize the last bite has no chocolate chip in it. Buttery, soft, thick, chewy cookie perfection. And the perfect welcoming gift for my friend Angie to the Philippines! Our last visitor of the year. I feel some good times coming on. I love you guys. I hope these make you insanely happy. 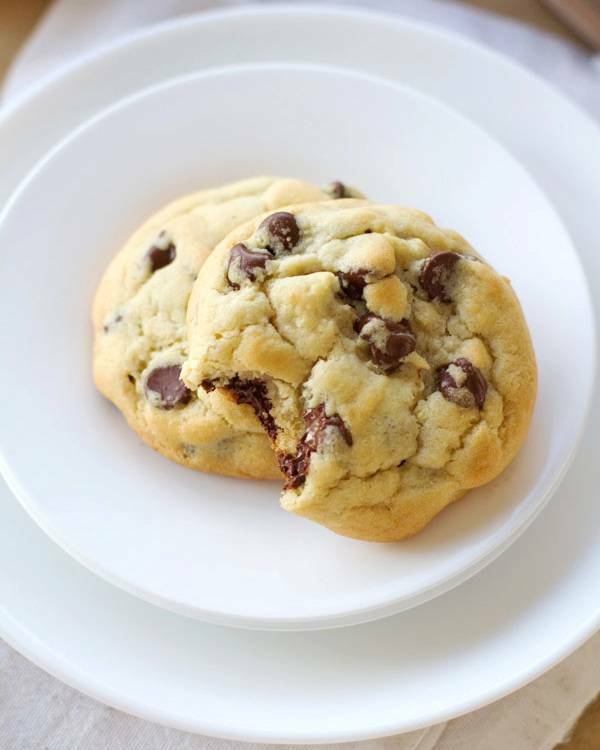 These perfect chocolate chip cookies are adapted from the recipe on the back of the Hershey’s bag! So easy and SO addicting. Turn the oven on to 350 degrees. Put the butter in the oven in a stainless steel bowl as it’s preheating until about half of the butter is melted. Turn the oven off. Let the butter come back to room temperature – it doesn’t have to harden completely but just so it’s not hot anymore. Add the sugar, maple syrup, and vanilla to the bowl with the butter. Cream with electric mixers until well mixed. Add the eggs and beat on high speed for 1 minute. Measure in the flour, baking soda, and salt. You can do this in a separate bowl, but I usually just dump it all into the mixing bowl. Slowly mix with the electric mixer on low speed, scraping the sides, until all the flour is incorporated. Stir in the chocolate chips with a wooden spoon. Refrigerate for 2 hours or more, until firm. I refrigerated mine overnight. Preheat the oven to 375 degrees. When the dough is firm, roll 2 tablespoons or more into high, round balls. Place on a baking sheet a few inches apart and bake for 8-12 minutes. Sorry for the discrepancy – our oven here is so hard to read (literally, there are no temperature markings) so I usually just watch them after 8 minutes to see when they look ready. You want to take them out when they are puffy and just a tiny bit brown on the tops and edges. Let stand for a few minutes – they will lose a little of their puffiness but they should stay thick and hold together well. Our butter measures differently here in the Philippines and it is very salty. So based on the comments, I have adjusted the amount of butter to be slightly less than 1 cup and to call for salted butter. If your first batch still comes out flat, I would suggest adding more flour (up to 1/2 cup). These are not meant to be flat! 🙂 I tried baking these on two different pans – one was a cheap aluminum baking sheet and one was actually Calphalon brownie pan (! ), and both kept the cookies nice and thick. When you first take them out of the oven, they will look more pale than a normal golden-brown cookie but that’s normal. They start to look more even as they cool. These cookies should stay really thick and chewy even a day or two later. I like them stored in the refrigerator so they are firm and cold, but still buttery and soft. It’s important to consider your altitude, humidity, oven tendencies, etc. when baking these. Here’s a link with some helpful tips for making adjustments at the bottom of the page. Update: 300,000 cookies later, I’ve put together this post outlining some simple tips that I use when I bake these cookies that I think will help your cookies turn out thick and chewy and buttery-perfect! 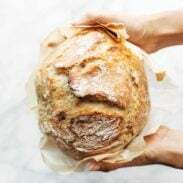 Update May 2015: I have recently posted a new version of this recipe that still gets the soft texture WITHOUT requiring any high maintenance butter melting/cooling. Here’s the new recipe! The maple syrup in these is intriguing. I haven’t tried that before but it is a great idea. The pictures make these cookies look like they are melting off the screen! Yep. I have another post with tips and an adjusted recipe that’s really similar but doesn’t use syrup… It’s linked at the end of this post. Yum! I’ve got to try this maple version! They look so soft and chewy! Sounds delicious! I love feeling when “you just go for it” with a recipe despite not having your usual ingredients and it turns out even better than you imagined. Culinary serendipity. I haven’t made chocolate chip cookies in ages. These look absolutely delicious! I’ll be picking up a bag of chocolate chips on my next trip to the store so I can make a batch of these! Okay, your cookies are making me drool. Really? These look soooo gooood. 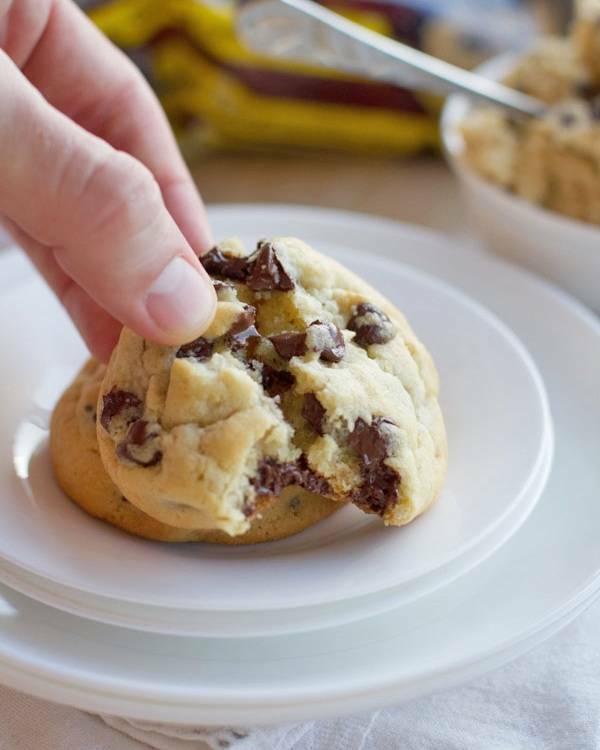 I love it when the cookie is FILLED with chocolate chips- yes, these definitely do look perfect! These cookies look insanely thick and chocolate-y! I’m sure they are the “perfect” chocolate chip cookie 🙂 I can’t wait to try out your recipe. These look fantastic! I’m with you on using the whole bag of chocolate chips! Oh my gosh those really ARE perfect!! We never have too many CCC recipes. And we love them in my home. When we take them out of the oven we want to eat them right away. Thanks for the recipe! Wow, you are only 26?! You have accomplished so much at such a young age, Lindsay! You make me feel like a slacker 🙂 These cookies look delicious, I will definitely be making them for my kids this weekend! Hahah – thanks Jenny. 🙂 Hope you like the cookies! We love cookies so I can not wait to try these! Beautiful photos, and nice recipe! These look great. 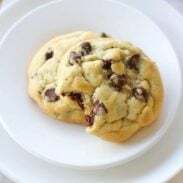 My “family secret” chocolate chip cookie recipe is to use the Nestle Tollhouse (said in the Phoebe Buffay from Friends way – “Nesssstleeee Toulhoose) recipe, but to just use 1 stick of butter instead of 2. Somehow, LESS butter makes a better cookie. They’re fluffier and not as thin, and more chewy. Who knew? Wow – I’m surprised! That’s a big difference, too! Nice that it works out that way, right? Lindsay ~ I can’t wait to make these. Just one question … what size bag of Hershey’s chocolate did you use, 16 oz? Thank you!!! Yep! It equals out to about 2 cups. Oh, we love us some chocolate chip cookies in this house! We’ve only strayed from our favorite two recipes ONCE, but I’ll give this a shot. Really, can you go wrong with cookies + chocolate chips?? Perfect looks about right! I guess my diet could start AFTER I make these. I have to get in line with everyone else riding the Lindsay train on this one. These cookies look wonderful! I can almost smell them baking just by looking at the pictures. I’m a big fan of your blog and I usually try your recipes within a few days of you posting them! I made these cookies last night but the first couple batches turned out really flat and thin–they don’t look like yours at all! I baked them for 8 minutes at 375. I’m about 95% sure I followed the directions…any ideas?? They still taste delicious! Bummer!! Did you refrigerate them? The dough should be pretty firm so you can roll it into balls when you put them in the oven. – Increase flour to 2-2/3 cups. – Decrease baking soda to 3/4 teaspoon. – Decrease granulated sugar to 2/3 cup. – Decrease packed light brown sugar to 2/3 cup. – Add 1/2 teaspoon water with flour. – Bake at 375°F, 5 to 7 minutes or until top is light golden with golden brown edges. Thanks for replying! Yup, I refrigerated them for 2 hours before I made the first batch, and then overnight before I made a couple more pans. I still have some dough in the fridge now, and I might try using a different baking sheet. If that doesn’t do anything…then who knows, maybe I added something wrong 🙂 Still chocolately and tasty though! Thanks again for the recipe. Hmm I had the exact same problem! I know I followed the recipe to perfection, but my first batch came out flat as pancakes. I refused to give up on them after throwing in a whole bag of chips though! So I tossed an extra 1/2 cup or so of flour in the last.. half-ish of my batch and they turned out like the photo. 🙂 Sneaky! I rarely have problems with recipes, but luckily there’s always a way to fix it! Eric is a chocolate-chip cookie fiend. He loves them; he really does. I’ll have to give these a try and see if they stand up to (da-daa-da-daaa) his mom’s 🙂 Love the though of maple syrup in chocolate chip cookies. Yes. Oh My! Don’t these look wonderful! A few weeks ago I was making chocolate chip cookies and I didn’t have enough brown sugar. I made them with just the white sugar but never thought to add maple syrup or a little bit of the brown sugar! What a great idea. 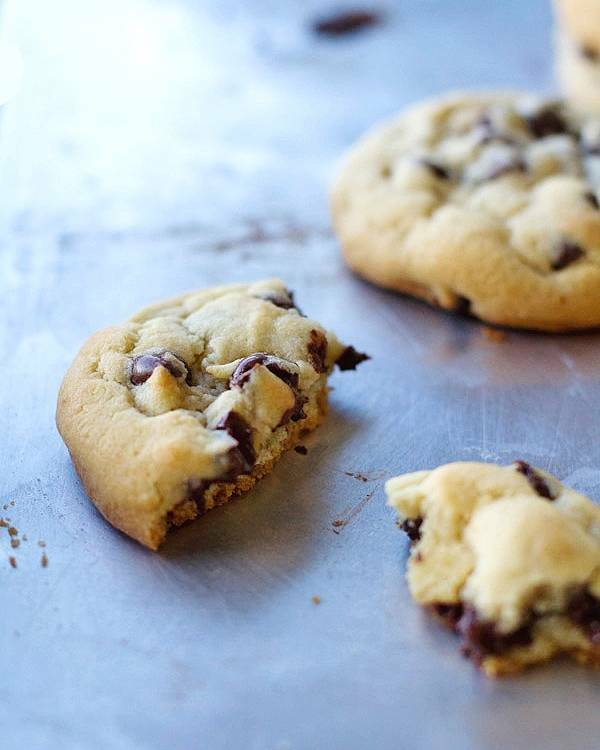 These look about as perfect as a chocolate chip cookie can get! I’ll have to remember to try maple syrup the next time I am running low on brown sugar! hahahha pasty legs…i hear ya. and i am so excited these call for real maple syrup…i just got a fresh jar from my uncle who is making his own this year…yeah…love a reason to use it in cookies! How fun! Real maple syrup made by someone you know… Awesome! Just made these tonight to introduce to Spanish friends the wonders of American baked goods tomorrow. They turned out AMAZING. Thanks! Great! 🙂 thanks for the comment – hope your friends enjoy them! Have just made the dough for these cookies, but was a bit confused as to how much weight a bag of Hersheys semi sweet Choc chips actually is. (I live in Australia and we don’t have that brand here) I ended up throwing in a 250 gm bag of generic choc chips, but it does seem an awful lot and I am keeping my fingers crossed that I haven’t overdosed the dough mix. I did have to add some extra flour as mixture seemed a bit too gluggy, but possibly due to high Autumn temps here (90+F). Anyway dough is sat in fridge for next couple of hours before baking begins. No worries, the cookies turned out just fine and other half helped himself to 3 before his dinner! He said they were delicious, I don’t eat chocolate, so didn’t taste them, but they certainly looked good on the cooling rack. Managed to get 48 decent sized cookies from this recipe. I also substituted raw sugar for the white as I never keep white sugar. Am thinking of using your dough recipe, minus the choc chips and adding Cranberries and Macadamias, so I can get to eat them!